Sometimes I ache with the pain of knowing I will never be able to read all the books that I would like to. I have been known to become near hysterical in bookshops when confronted with literature in all its wonder and the subsequent realisation that I will have to choose just a few from this immense collection. This affliction has been present since childhood when I was known to ignore all company present and throw myself, literature in hand, between my parents and their friends with the demand “read a book”. Like many fellow English teachers, I grew up in a household which encourage and supported reading. 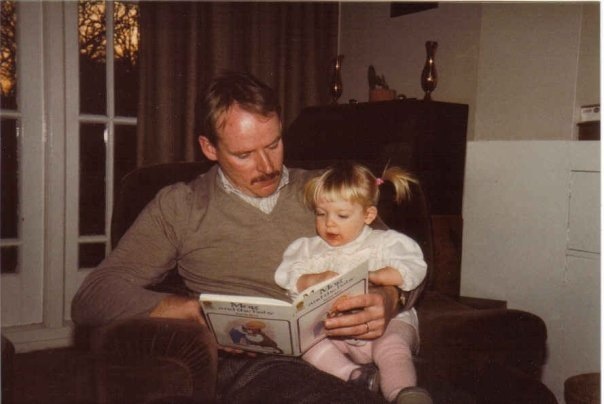 This early photograph shows me reading with my father, absorbed in the tale of Mog the cat. Like many childhood stories, the memories of this reading are both of that time and also made later in the re-discovery of the book and the re-counting of these reading experiences from my parents. I wonder whether the memories of immense anxiety and sadness during ’Mog and the bunny’ – where Mog stares hopelessly out of the window looking for his lost cuddly toy – come from the actual experience of reading the book or are memories imposed later on. I’ll never be sure but nonetheless this emotional interaction with the story has somehow been sewed into the fabric of me; the beginnings of an identity so often defined by my relationship with books. Stories are central to our understanding of who we are, whether these are stories told or passed down through families, stories we create ourselves or those which come bound and presented to us in the form of literature. Often the experience of reading, the story which surrounds the book is inseparable from the story within. It can be hard to know what is you and what is made you through what you are reading. Later in my childhood, the identity I cultivated through books was one of adventurer and dreamer; whether battling through magical lands of fairy tales; walking hand in hand with Anne of Green Gables along wooded paths or exploring shipwrecks with the cast of an Enid Blyton story. My imagination was, and continues to be, extremely vivid. I once woke on Christmas Eve and pressing my nose against the cold damp of the window, I saw Father Christmas and his sleigh in all its sparking glory fly down onto our lawn. It was completely real to me. Similarly as a consequence of handwritten stories by my mother in her role as “Petunia the Tooth Fairy”, I became a night-time visitor to Fairyland; I had been told that I could wish myself there in my dreams and so I did, waking in the morning post-flight to enchant my younger sisters with stories of my adventures. So books made sense to me, they captured what was already alive in my mind and added a richness to the stories which I had written in my imagination. I never felt that I was strange in living in this fantasy world as books confirmed that many others had done the same before me. As it became clear to me that books were an integral part of my life, it also became important to define myself as a ‘reader’. I think this lead me to adult classic texts; I was unconsciously defining myself as a student of literature. At bedtimes my mother and I would read ‘A Pilgrim’s Progress’ together and I learnt the joy of working to unlock the beauty of a text. 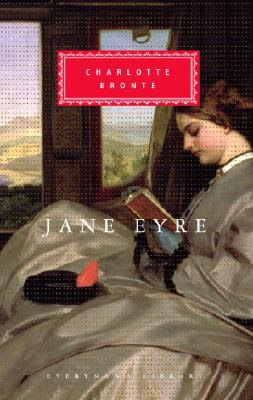 My first reading of ‘Jane Eyre’ when aged 10 had the same impact, and here I also found a protagonist who was beginning to find a sense of her self both through the books she read and through her experiences with others. I have returned to this book many times throughout my life, at each stage finding a different aspect to love and with which to identify but the opening chapter of Jane seeking refuge in a window seat with a book and identifying with the characters and worlds she found in her reading always resonates. During my teenage years, books became an escape from adolescent torment and heartbreak and also became love affairs themselves. Reading great books often feels like falling in love; the same breathlessness and joy, the moments of intense happiness and crushing pain; the feeling of wanting to race through to see how it ends and the sorrow when you say goodbye. From the age of 13 onwards I also fell for the heroes of the stories I read: Darcy; Knightley; Rochester; Odysseus; Captain Corelli – a whole handful of terrible and wonderful loves. My classmates and I devoured the classics at school and supplemented these with a host of trashy American ‘novels’ about proms and high schools. We were reading about who we were meant to be, torn between the academic lives we lead at school and a sense of modern adolescence that supposedly existed beyond house parties and British beach holidays. It was during my sixth form years that I also found myself beginning to use books to help me get an understanding of what it meant to be a woman. In Classics class, I was completely transfixed by ‘The Odyssey’. I wanted to live in that world, to bathe in the beauty of it all and be absorbed by it; yet I remember the confusion of what it meant that I wanted to be Athene not Penelope in Odysseus’ life. I also spent many a Classics lesson arguing the case for understanding Medea and beginning to question the absence of real female voices. In English, I loved everything written by Austen and kept my re-reading of Bronte. At university this interest in literature featuring strong women or produced by women developed through studying Virginia Woolf and my own reading of literature from Anais Nin and Jean Rhys. Having been at an academic all-girls school, I was disconcerted to find that the world beyond this had a different idea of women, especially those who were intellectually engaged. I began to feel that sense of ‘otherness’ which I had been cosseted from in my upbringing. Literature allowed me to navigate this confusion and explore all the different elements of what it means to be a woman. Many of the books I read at university opened my mind beyond my own experience and two which had the most profound effect came from the opposing ends of the literary timeline: ‘Paradise Lost’ by John Milton and ‘Paradise’ by A L Kennedy. Both are books with a poetic brilliance to them and which engage with ideas of religion, of good and evil, of passion, of sin and redemption. Most importantly, they both left me feeling changed; a different person simply through reading. Two books which have had this effect in my post-university years are ‘The Road’ by Cormac McCarthy and ‘What I Loved’ by Siri Hustvedt; both of which made my soul hurt. There is something immense about this cathartic ability of literature to capture a deep human sense of pain and loss, which tears you to shreds and leaves you renewed and different by the end of reading. Writing this somehow seems like a betrayal to all the great books and authors that I haven’t mentioned, or haven’t yet discovered, but I feel lucky to have had such a wonderful experience of reading and to know that there is so much more to come. I am also unbelievably privileged to have a job which is about sharing literature and introducing pupils to books which will shape who they become. I will always love reading for that, for the power it has to change lives and the way it give us all a home however lost we feel in this mad old world. This entry was posted on August 15, 2014 by ragazzainglese in Reading.